Done that, and re-configured the start menu, and yes it's now there and working again, or at least launching. Well, I've checked two USB's on four PC's now and it's the same result on each. Even rebuilt one USB from scratch and exactly the same. mbam.exe runs for a little while before the error pops up. The Tool Shed / Re: Are you tired of looking for the drivers for your devices? 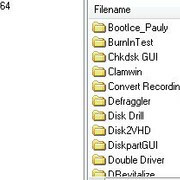 What I do for speed is, overwrite the boot.win (cos the size is often different), delete the programs inside the programs folder and copy the new programs from the .iso over adding a few others of my own. Then remake the start menu. Doing it this way, am I missing something? General Discussion / Re: Welcome!